The design of blue petals, green leafs and yellow pistil flower over a white background looks fabulously on a kitchen tile backsplash and counter. Or decorate your exteriors wall and around the fountain basin. Mexican handcrafted ceramic tile “Blue Flower” will boost a warmth, cheerfulness and florid look into any large and small space. While changing our kitchen backsplash from old kind of seventies looking tiles we decided to place some decorative accents. Since our kitchen is facing a beautiful garden full of flowers we wanted to add some ceramic tiles to the backsplash with floral design. Our choice was selecting this blue flower style tiles from Mexico painted on yellow background to match the remaining wall tiles. They agreed to painted them for us with a different color background at no extra cost under the condition we buy a full box. It included nighty tiles and it was fine with us. The background color they used was little bid darker than we thought. 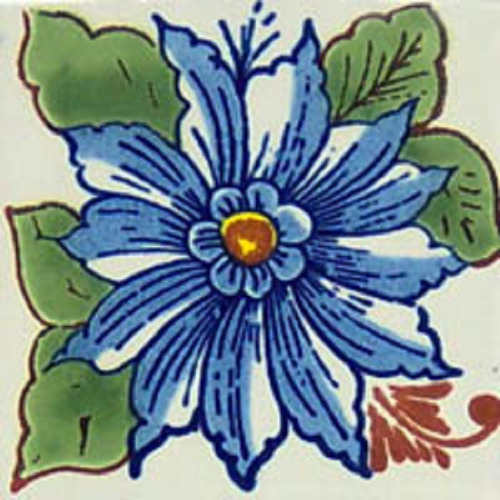 Mexican Tile "Terra Cotta Flower"